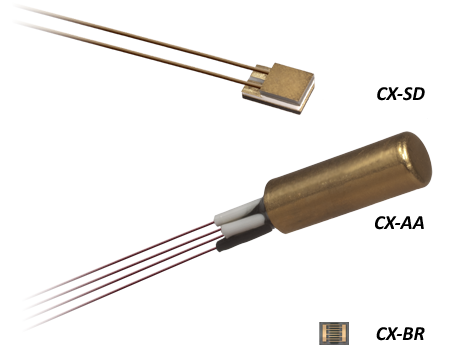 Cernox™ thin film resistance cryogenic temperature sensors offer significant advantages over comparable bulk or thick film resistance sensors. The smaller package size of these thin film sensors makes them useful in a broader range of experimental mounting schemes, and they are also available in a chip form. They are easily mounted in packages designed for excellent heat transfer, yielding a characteristic thermal response time much faster than possible with bulk devices requiring strain-free mounting. Additionally, they have been proven very stable over repeated thermal cycling and under extended exposure to ionizing radiation.